Does anyone else sew with an old sewing machine? If so, what models? My favourite machine is my 1958 Singer 99k. I sew corsets and she'll get through the layers without breaking a sweat. She also has attachments that work, unlike the feet for my modern machine. I've also got a Singer 15 (20s with later adaptions) and my mums 60s Jones. I've had a few others that i've cleaned up and passed on. Including a lovely little handcrank 28k from 1901 with a coffin top case. It's lovely seeing them come back to life. I have a 1958 Singer Slant-O-Matic 403 special. It was my mother's junior high school graduation gift, purchased with the proceeds from the sale of her grandmother's treadle machine. I have an old lathe and an old milling machine. Does that count? I have an old sewing machine, but I've forgotten how to use it! It's lovely to look at though and still works fine, if I could remember how to thread it! I have a White, ca. 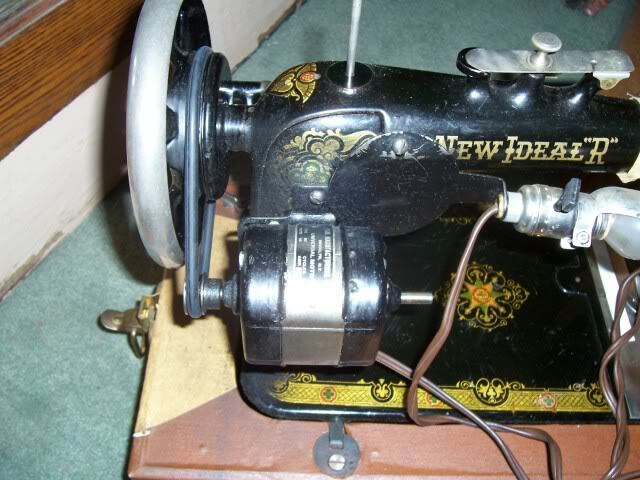 1940, but just as I got it oiled and replaced the bobbin I was sucked into the Great Knitting Black Hole. I haven't used it once!